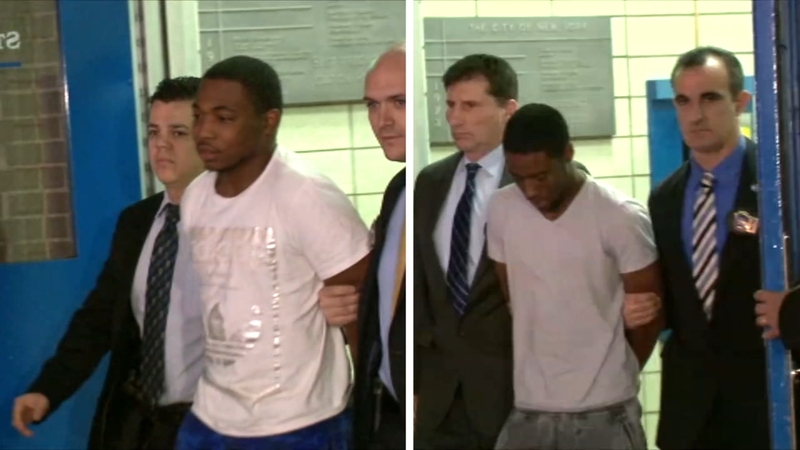 BEDFORD-STUYVESANT, Brooklyn (WABC) -- Two suspects accused of indiscriminately firing gunshots into a Brooklyn courtyard and killing two young mothers earlier this year were arraigned Friday. Acting Brooklyn District Attorney Eric Gonzalez announced that 20-year-old Nazir Saunders and 18-year-old Anthony Alexander are charged with second-degree murder and second-degree criminal possession of a weapon in connection with the July 12 shooting on Gates Avenue in Bedford-Stuyvesant, which claimed the lives of 21-year-old Chynna Battle and 29-year-old Shaqwanda Staley. The women were struck by stray bullets. Battle, who had a 3-year-old daughter, was struck in the head, while Staley, mother to a 9-year-old girl, suffered a gunshot wound to the back. "These defendants displayed an utter and complete disregard for human lives when they allegedly shot up a courtyard that was crowded with people," Gonzalez said. "Predictably, they struck two innocent bystanders, young women who left behind daughters, friends and loved ones." The suspects were held without bail and ordered to return to court on November 22. They each face up to 50 years to life in prison if convicted of the top count. According to the investigation, the defendants entered the courtyard around 9:30 p.m. and opened fire at a group of about 20 people were hanging out inside the location at the time. They missed their intended targets and fatally struck two women who were in the courtyard, authorities said. Both defendants were arrested in South Carolina on October 31, 2017.